A few years ago, I had a romantic notion of going to Mexico for a few weeks, renting an apartment near a market and learning how to shop there daily, bringing home lots of new (to me) ingredients, and cooking up something incredible. I never managed to do that and the dream kind of got put on the back shelf. However, without really planning it, I have accomplished that here in Calca, Peru. It just so happened that I found a place to live here, Casa Willkamayo, that has a kitchen just for the use of the guests. Since I am mostly the only guest at present, it is my kitchen to command. It is very well outfitted for a guest-house kitchen (with even an adobe fireplace), and since my host, Mabel, loves to cook, she is happy to lend me any tools from her kitchen that I need. She is also very knowledgeable about the ingredients that I am not familiar with and can give me lots of advice. Then I moved on to Yolanda’s dairy stall, where I usually buy cheese. Today, however, I only got some fresh butter and honey. Then, to pick out the chicken. I have always been leery of purchasing fresh meat in an open market, but Mabel had assured me that the chicken here was fresh, so I walked up to Alex’s stall and got a kilo of thighs and breast for 12 soles (about $4). It certainly looked and smelled fresh. Now I was set…on the way home, I stopped by the little tienda a block from my guesthouse to get some eggs for the dough. As soon as I unpacked everything, I got to work. Before long, I had made the two fillings, one sweet, one savory and the two types of dough were chilling in the refrigerator. I found a great website where you can learn everything you want to know about empanadas, including some great recipes for dough here. Chilling the dough for ½ hour resulted in a very pliable dough which I could roll out very thinly without it tearing. I flavored the doughs—one with cumin and pepper, and the other with honey and cinnamon and an extra egg to add richness. The chicken filling consisted of browned onions, aji amarillo, garlic, chicken, olives, cumin, salt, and pepper. This is similar to the filling I often use for tamales. 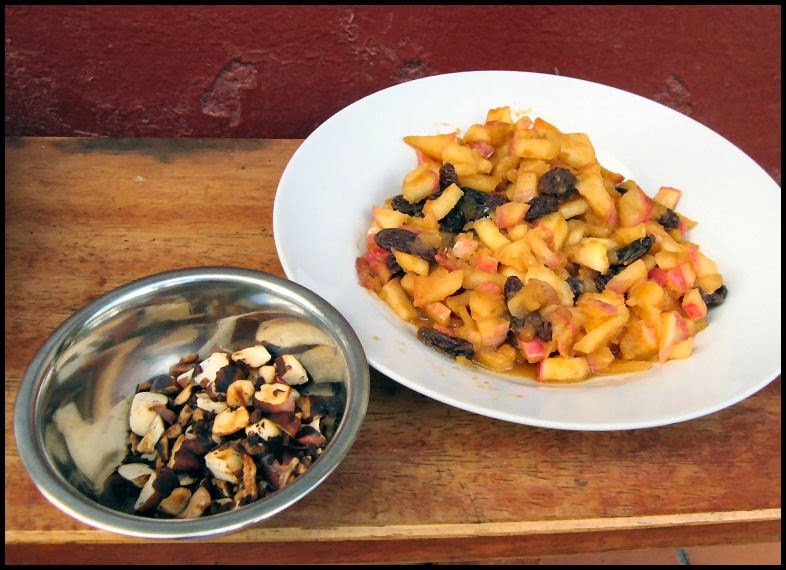 I also made a sweet apple filling with fried apples, raisins, cinnamon, sweetened with algarrobina. Because the dough was so pliable, everything assembled easily and before long, the empanadas were ready for the oven. Fenn, the 4-year-old son of my hosts, kept coming in to check on my progress and make sure he was not left out of the eating part. When all was ready, I assembled a quick ensalada of cucumbers, avocado, and tomatoes, sprinkled with lime juice, and invited everyone down to the outdoor table for a snack. I cannot wait to make more empanadas—what fillings should I use next? Squash? Cheese? Potatoes? Scrambled eggs and veggies? Bananas? Pumpkin? What do you think? 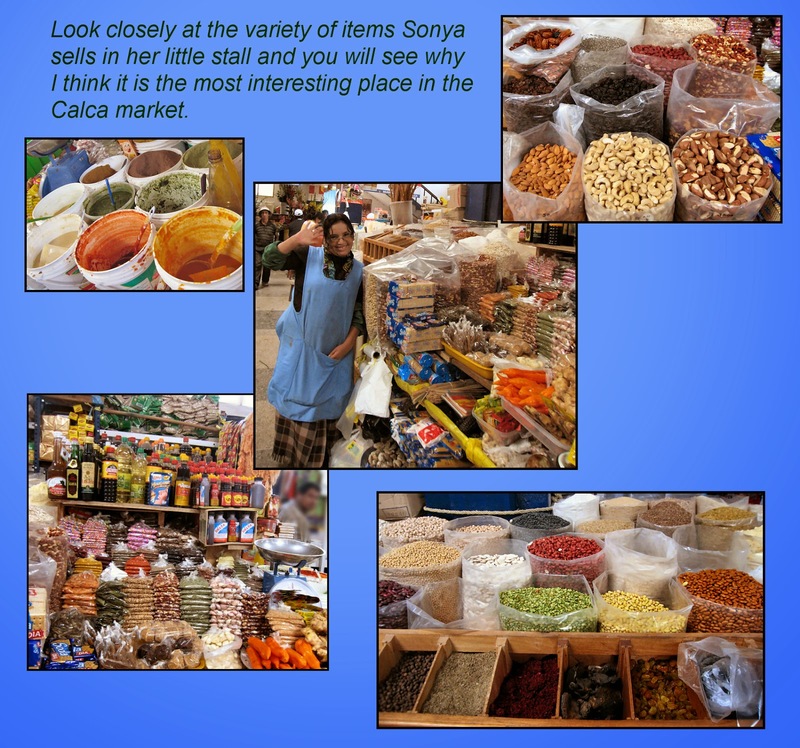 Looking at your market photos reminds me of…. Do you ever get lonely cathy? Without a travelling companion? I don't get lonely…I have plenty of people around me for my lifestyle. And I have plenty to do to stay very busy. However, it was fun to travel here with Rebecca last year AND I look forward to going to Spain with you next year! Rebecca is looking forward to it as well. We should set a date soon, even if it is over a year from now, That way it will really happen!